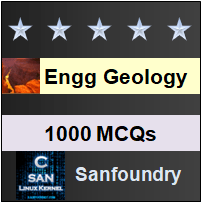 This set of Engineering Geology Multiple Choice Questions & Answers (MCQs) focuses on “The Crust”. 1. What is the thickness of the crust under the mountainous areas and in particular the Himalayas? Explanation: It is believed that the thickness of the crust under the Himalayas is 70 to 75 km and under the Hindukush it is said to be 60 km thick. Explanation: Mohorovicic discontinuity marks the lower boundary of the crust which is the first layer of the Earth. Explanation: SIAL stands for Silicon and Aluminium and as per the name it is made up of the two elements and hence the name. Explanation: The oceanic crust is estimated to have a volume of 2.54*109 cc with an average density of 3.00 g/cc. Explanation: Mohorovicic discontinuity from seismic evidence is determined that it is approximately at a depth of 30-40 km. 6. What is the speed attained by the P-waves in the C-layer under the Continental crust? Explanation: The C-layer is the lowermost layer of the continental crust and here the P-waves attain velocity as high as 6 to 7.6 km/sec. Explanation: The Middle layer or B-layer of the continental crust is relatively dense compared to A-layer and the density is said to be 2.4 to 2.6 g/cc. Explanation: Silicon and Magnesium. The C-layer under the continental crust is rich in Silicon and Magnesium and hence the layer is also sometimes called SIMA. 9. The oceanic layer is the extension of C-layer of the continental crust and A and B-layer are mostly absent. State whether true or false. Explanation: The oceanic crust is the extension of C-layer of the continental crust that makes the top layer of the oceans in most cases, A and B layers being practically absent from there. Explanation: The A or the upper layer is between 2 to 10 km thick and is of low density, 2.00 g/cc. Explanation: The first the options, Mountainous, Continental and Oceanic areas are studied separately whereas Glacial area is not considered under study of the crust as such.